The Kilauea volcano on Hawaii's Big Island erupted on Thursday. Over the next few days, lava covered Leilani Estates, and roughly 1,700 residents were evacuated. According to current counts by Hawaii Civil Defense, at least 35 structures have been destroyed, including 26 homes. 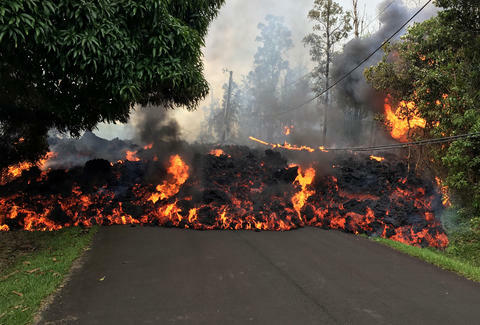 Kilauea is considered one of the most active volcanoes in the world, so lava appearing in the region isn't unheard of, but this level is shocking even for residents. "It's nothing that I've ever experienced on a personal level ever before," Jessica Ferracane, a spokesperson for the Hawaii Volcanoes National Park, told CNN. The videos below will give you some idea of what it's like on the ground on Big Island. Absolutely insane video out of Leilani Estates, HI. NEW VIDEO: Breathtaking yet saddening aerial footage of the lava flowing into the Leilani Estates subdivision east of Mount #Kilauea in Hawaii. The earthquakes had settled down a bit on Sunday, and residents have been allowed back in neighborhoods to retrieve their belongings.